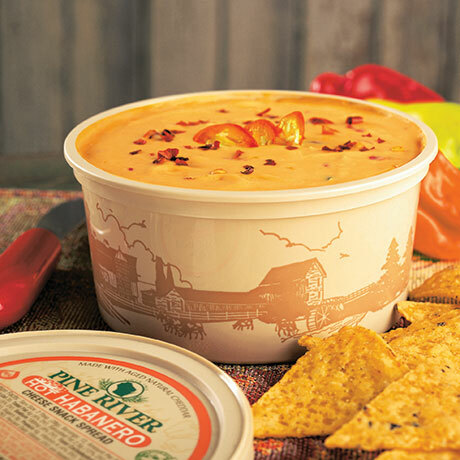 Golden Cheddar cheese with a flavorful kick of HOT Habaneros. 12-ounce cup. SHARP CHEDDAR CHEESE (MADE FROM PASTEURIZED CULTURED MILK, SALT, AND ENZYMES), WATER, REDUCED LACTOSE WHEY, MALTODEXTRIN, CREAM, WHEY PROTEIN CONCENTRATE, SKIM MILK, NATURAL FLAVOR, MODIFIED CORN STARCH, LACTIC ACID, DISODIUM PHOSPHATE, SORBIC ACID (A PRESERVATIVE), GUAR GUM, PURE HABANERO POWDER, CAYENNE PEPPER, JALAPENO PEPPERS, SEA SALT, ANNATTO COLOR, BELL PEPPERS.